We’d love your help. Let us know what’s wrong with this preview of The Surgeon's Wife by Kieran Crowley. Gail's parents had been thrilled to In the summer of 1985, in his exclusive Upper East Side Manhattan apartment, Robert Bierenbaum, a prominent surgeon and certified genius, strangled his wife Gail to death. He then drove her body to an airstrip in Caldwell, N.J., and dumped it into the Atlantic Ocean from a single-engine private plane. The next day he reported her missing. Gail's parents had been thrilled to learn she was marrying Robert Bierenbaum. He seemed to be the perfect match for their daughter. he was from a well-to-do family, a medical student who spoke five languages fluently, a skier, and he even flew an airplane. But Gail would come to learn of her husband's dark side. On one occasion when Robert had tried to choke Gail because he caught her smoking, she filed a police report. She also alleged that he tried to kill her cat because he was jealous of it. For year, her sister pleaded with Gail to run for her life. Even her therapist warned his vulnerable patient that she could eventually die at the hands of the man she married. Fifteen years after this unspeakable, unfathomable crime, a jury found Robert Bierenbaum guilty of murder--and stripped the mask off of this privileged professional to reveal a monster. To ask other readers questions about The Surgeon's Wife, please sign up. I really have to give it up to Mr. Crowley, the author of this book. He did a spectacular job in portraying both sides of this case. I must say that after reading this and all of the evidence, I am not so sure that Dr. Bierenbaum should be sitting in that jail cell right now. Gail clearly had her own issues when she disappeared & although I am not a supporter of reading all of the victim's dirty laundry in the true crime books I often read, in this case I think it was extremely important for I really have to give it up to Mr. Crowley, the author of this book. He did a spectacular job in portraying both sides of this case. I must say that after reading this and all of the evidence, I am not so sure that Dr. Bierenbaum should be sitting in that jail cell right now. Gail clearly had her own issues when she disappeared & although I am not a supporter of reading all of the victim's dirty laundry in the true crime books I often read, in this case I think it was extremely important for Mr. Crowley to state it. Gail was promiscuous, a drug user and most importantly was suicidal numerous times in her past. This was the main reason that led me to believe that she might have disappeared on her own or got involved with the wrong crowd. However, one can not forget that Dr. Bierenbaum was a surgeon and was also knowledgeable enough to cute her body into pieces, tie a weight to her and dump her body in the ocean as he flew his private plane........ I just don't know what really happened in this case or what side to believe. I bought this book because of the great reviews and hated every minute of it. It was written terribly despite the author being a New York Times bestselling author. Repetitive - Entire sections were repeated. Not certain I am a fan of this author. The book was absorbing for long stretches, but repetitive and speculative in others. Editorial efforts were VERY sloppy. Twice, half a page was repeated, verbatim. Many sentences were cut off or nonsensical. The story itself is very interesting, but the sloppy editing is so prevalent that it disrupts the flow of the story. Having recently read and enjoyed ALMOST PARADISE by this author, I decided to re-read his earlier book THE SURGEON'S WIFE. It was good, but did get repetitious when the trial started; apparently Keiran's technique improved in the four years between these books. The ebook version was also loaded with typos, most of which were clearly the result of OCR scanning. Quite possibly the most thoroughly researched and unbiased true crime story I’ve ever read. The author is an excellent writer with well-crafted sentences that are often absent in this genre. Interesting twist on the usual true crime story. The role of the psychiatrist makes it especially interesting. The author's final thoughts have me lots to think about. great book too bad it took so long to get him. It was an interesting book but sad that Gail, the wife, lost her life. The author's reporting of the court room got alittle old. Overall a good book. This was a cant put down book!!! This review has been hidden because it contains spoilers. To view it, click here. My rating may be slightly high due to the fact that one of the people involved with this story was my doctor. I googled her name once and by chance found out about another doctor who was convicted of murdering his first wife nearly 20 years after her disappearance. There were some disturbing "early" stories about Robert Bierenbaum, but also comforting newer ones, such as his pro bono work done for impoverished Mexicans. Gail, while she certainly didn't deserve to be murdered, had a dark past. I th My rating may be slightly high due to the fact that one of the people involved with this story was my doctor. I googled her name once and by chance found out about another doctor who was convicted of murdering his first wife nearly 20 years after her disappearance. This books was mediocre. It wasn't too badly written but there were parts that were a bit redundant and though it's a sad story and the guy is a psychopath it was hard to get into it or to feel a connection to the victim as she was a conniving manipulator who was really just using her husband anyways. It's sad to think that not only did she lose her life, she didn't even get a chance to experience real love and instead wasted her time with an abusive man that she didn't even love anyways. 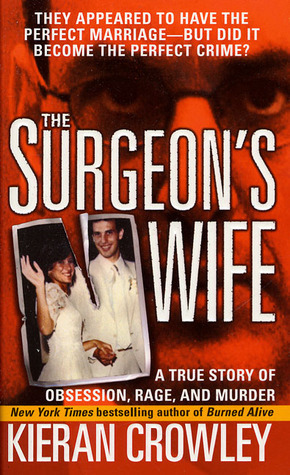 The Surgeon’s Wife by Kieran Crowley is the true story of Gail and Robert Bierenbaum. Once married, their marriage went south in a hurry. One day Gail is no longer around. Did Robert kill her? I got into this book fast. The trial part of the book was fascinating. I know this book is like ten years old, but it’s very good! Experienced writer, Kieran Crowley, does a skillful job retelling the story of how a young, impulsive doctor's crime, committed against his wife, comes back to haunt him 14 years later. I gave this book 4 stars and recommend it as a choice true crime read. Challenge 14. A nonfiction book. This book was ok. Interesting story but it only needed half of the information. A lot of it was really tedious or just unnecessary. It would have made an excellent short story or even half of this long book. A truw crime. Not the kind of book I would normally read, but it was pretty interesting. It started kind of slow, and I almost gave up reading it, but the second half picked up and I really got into it. This was an interesting story, but I think the author tried to write in Anne Rule's style and he just didn't succeed. The book is very long and the narrative is rambling with many repeats of information that had already been given. There are better true crime books out there, so avoid this one. IT DRAGGED. ON And ON about minutiae I am not even sure why it was in there. Not a favourite, but will read Kieran Crowley again! Mostly interesting to me in that I was looking into this true story. KIERAN CROWLEY is a New York Times bestselling crime author and investigative reporter who has received communication from an actual serial killer and deciphered his secret code. Crowley has covered hundreds of trials and thousands of murders and recovered evidence missed by police at numerous crime scenes, some of which helped bring killers to Justice. He lives in New York with his family.